For better or worse, the world has two new Chrome-based desktops. 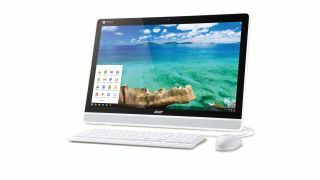 Acer has finally unveiled the Chromebase DC221HQ all-in-one desktops it first teased back in April. The new desktop lineup will feature two 21.5-inch computers, one touch-enabled and one with a standard screen. Both displays will feature a 1,920 X 1080p full HD resolution. Under the hood, the Chromebase will feature an NVIDIA Tegra K1 quad-core processor, and a storage capacity of up to 16GB of data. If you buy this desktop, you'll also receive 100GB of free Google Drive storage. Acer boasts a speedy start-up time of 10 seconds for these AIOs, which come standard with 4GB of DDR3 1600Mhz memory, but we can't guarantee that speed until we get our hands on a unit. The Acer Chromebase is available for $429.99 (£270, AU$556) with a touchscreen, or $329.99 (about £200, AU$360) for the standard model. As we learned in April, the Chromebase can be mounted via a VESA interface, so you can attach it to a stand, bracket, arm or wall, which should please managers of cramped offices and purveyors of retail stores that require easy access to inventory navigation. The Chrome desktop phase has only just begun. The market already has a solid entry, the LG Chromebase ($349.99, £207, AU$376), an affordable and easy-to-use desktop that is limited only by a weak speaker and uncomfy keyboard. There is also Acer's Chromebox ($179, £178, AU$230) tower, which does not come with a dedicated monitor, but serves as a nifty machine that can be transported from office to office. The Chromebook market is incredibly mature, with dozens of incredible options available from multiple manufacturers, including Acer. However, as more and more users move away from Windows-, OS X- and Chrome-based desktops and laptops to tablets and hybrids, you've got to wonder if there is a large enough consumer base for Acer and LG to capitalize on Chrome-only desktops. What are the Best Chromebooks on the market?